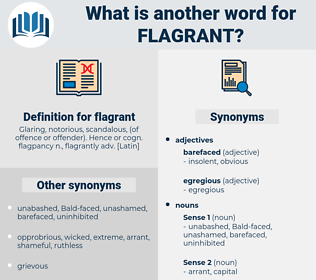 What is another word for flagrant? 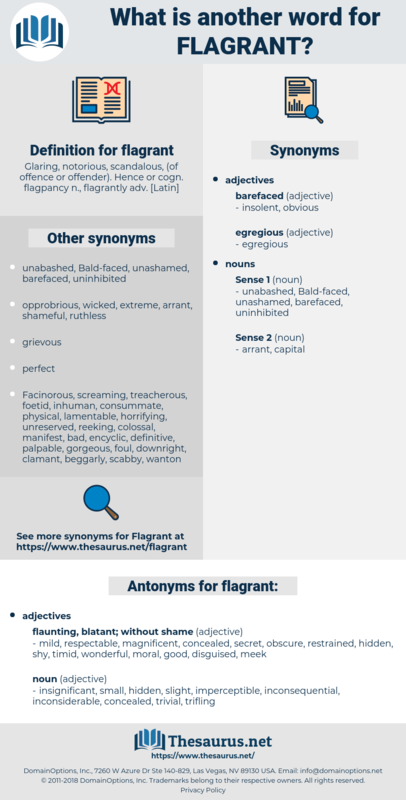 stark, wanton, conspicuous, undisguised, outright, serious, grave, rampant, self-evident, visible, patent, noticeable, spectacular, notorious, naked, harrowing, disgraceful, blunt, palpable, shameless, overt, appalling, unmistakable, open, significant, brutal, drastic, monstrous, unequivocal, overwhelming, poignant, tangible, distressing. obvious, evident, striking, scandalous, outrageous, severe, manifest. mild, respectable, magnificent, concealed, secret, obscure, restrained, hidden, shy, timid, wonderful, moral, good, disguised, meek. inconsequential, trifling, trivial, small, slight, insignificant, imperceptible, inconsiderable. Sir Henry's vehement insistence on his infallibility struck Sir Herbert as a flagrant violation of the rules of the game. Though the judges found no small difficulty in explaining the law, and different acts of parliament, yet the facts were so numerous and flagrant which were proved against them, that there was no difficulty in bringing in a verdict of guilty.